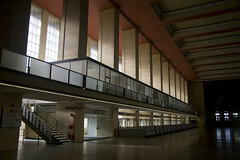 The last weekend I was in Berlin we went on a tour of Tempelhof airport. Tempelhof, now closed, was one of the oldest major airports in Europe. Orville Wright flew at the location in 1909. The later terminal building is a great example of architecture from between the wars, and is absolutely enormous. Some of the highlights of the tour were the basketball court, used by American servicemen, the large main terminal hall, and the underground bunkers. Click through for plenty more pictures. Wow, good eye. I didn't recognize Aeroflot until you pointed it out. Couldn't really make out anything else. There was graffiti EVERYWHERE in the underground area.